As the seasons turn warmer, Pacific Northwest waters glisten and dance, and the inviting sea mist beacons travelers to the San Juan Islands. The ferry-serviced islands are the biggest draw for locals and visitors: Orcas, San Juan (Friday Harbor), Lopez and Shaw. And each island offers something different. Each June, the ferries run on a summer schedule departing from Anacortes. And when the summer schedules start, the islands swell with visitors. The best time to visit the San Juan Islands is between April and October. July and August are the warmest months to visit and also the busiest. The summer months bring on peak prices, too. Knowing how to visit the islands efficiently can help you enjoy your time there without draining your pocketbook. If you plan to take a car on the ferries to visit more than one island, there are additional costs to consider depending on how you map out your stay, when you plan to visit and the length of your vehicle. The most cost-effective way to visit more than one island is to know how the ferry schedules and fees work. Ferries take off from Anacortes. Plan ahead for a two-hour drive north from Seattle and arrive at the ferries at least two hours before your ferry leaves, especially during the peak summer season. The quickest way to squelch your island trip is to miss a ferry and have to wait for the next one. Wait times in between can be long. Once at the ferries you have two options. Pay to park your car and walk on the ferry. Or pay to take your car on the ferry. You are charged for your car on westbound travel only. That means to keep your costs down you'll want to begin your stay as far west as possible. The two farthest islands west of Anacortes are San Juan Island and Orcas Island. San Juan Island (the location of the well-known town, Friday Harbor) is a foot-friendly island. Meaning you can walk on interisland ferries from where you are staying and not need a car to explore San Juan Island, saving you transportation money. The most cost-effective way to explore more than one island with a car is to pay the applicable fees to take your passengers and car on the ferry headed to Orcas Island first from Anacortes. By starting your island trip on Orcas you can then walk on an interisland ferry for free and do a day trip to San Juan Island (otherwise known as Friday Harbor) while staying on Orcas Island. After one or more nights on Orcas Island, you can take a ferry from Orcas Island to Lopez Island without getting charged again for your car. This is because you will be headed eastbound. After staying one night or more on Lopez Island, you can then catch a ferry from Lopez back to the mainland at Anacortes to conclude your time in the islands on a ferry budget. If you plan to go to any of the other ferry-serviced islands first, then you will get charged again for your car every time you head westbound with a vehicle. Just keep in mind after you initially pay to take your car on a ferry from Anacortes then as long as you keep going eastbound in your travels, you won't be charged again on interisland ferries for taking your car around to the different islands. Then when you return to Anacortes from whatever island you are on, the fee is waived since you are headed eastbound. According to the Washington State Ferries for the San Juan Islands, "Every time you go westbound you pay and traveling eastbound is free." Orcas Island is spread out and requires a car unless you are an experienced and fit cyclist. The ferry dock is not near town (the Eastsound). In order to get to the Eastsound from the ferry drop off point, you'll have to arrange for someone to pick you up if you walked on the ferry, or at the very minimum at least bring your bike to get to town. If you take your car, you can depart the ferry and drive into town. The drive into Eastsound after getting off the ferry takes about 20 minutes, sometimes more during peak season due to traffic. The historic Orcas Hotel is the first building you see when getting off the ferry at Orcas Island. If you want to stay closer to town within walking distance of stores stay at Eastsound Suites (they offer water views with a deck and modern-designed home features including a kitchen); The Outlook Inn (offers views of the water); The Landmark (also offers water views and kitchenettes). Rosario Resort on Orcas Island is another popular wedding venue on the island near Moran State Park. And there are plenty of places to dine while staying on Orcas Island. If you enjoy hiking don't miss Moran State Park on Orcas Island. You can also drive to the top of Moran State Park to see panoramic views of the island and the surrounding mountains. Orcas Island is not as busy as the other islands and is one of the most peaceful and serene to visit. Darvill's Bookstore in downtown Orcas Island offers water views while you shop for books or enjoy a coffee inside. Tres Fabu! in downtown Orcas Island offers chic women's clothing and accessories. The Country Corner Cellars on Orcas Island offers daily wine tastings and sells Northwest wine too. And the Crescent Beach Reserve on Orcas Island is a great place to relax and take in the beautiful beach surroundings of Orcas Island. Head back to the Orcas Island ferry dock (and park your car or bike) and then walk on an interisland ferry for free to San Juan Island (also known as Friday Harbor). Once at Friday Harbor, you can walk off the ferry and you will be immediately in the heart of downtown. Friday Harbor is ideal to discover on foot and can be done in a day trip. Friday Harbor offers many fun things to do right off the ferry dock where you can walk through downtown to shop and eat. There are also bikes and scooters for rent as you walk off the ferry as well as shuttles and more to help you get around the island. Shops to check out when you visit include Funk & Junk Antiques, Robin's Nest, San Juan Cellars, and the Griffin Bay Bookstore. There are lots of places to eat while at Friday Harbor too. Once you are done exploring Friday Harbor walk on the next interisland ferry back to Orcas Island. Pack up and head back to the ferry landing. Get in line at least an hour or two before your interisland ferry departs. In the summer months be sure to plan ahead and give yourself extra time; when your ferry arrives drive onto the interisland ferry headed to Lopez Island. Lopez Island is considered the friendliest island. It is also very flat and popular with road cyclists. Each year in April the Tour de Lopez attracts competitive cyclists thanks to its flat roads. You will want a car for this island or at minimum a bike to help you get around. There are many options for accommodations on Lopez and places to camp along with private residents options. And Lopez offers several restaurants and cafes. The Lopez Island community is tight-knit and friendly, especially to strangers. They put on a spectacular annual Fourth of July firework show with a parade through town each year. Lopez Island is popular with bike riders and also with kayak enthusiasts. Go on a kayak tour, play golf, visit the local winery or check out local artists. If you aren't interested in visiting San Juan Island on Day 2 then take an interisland ferry to Shaw Island. Shaw Island is the smallest of the four ferry-serviced islands. This island is a great place to visit with a pair of bikes to have a serene picnic. Locals of Shaw Island are fiercely protective of their homes and land; do not trespass, they will catch you! There are limited amenities on Shaw Island (only one small grocery store, no hotels, no restaurants). So if you go make it a bike ride/picnic day trip or stay the night at the Shaw Island campsites located two miles from the Shaw ferry landing. Keep in mind, Shaw Island is very tranquil in sound. But loud in negative "no trespassing" signs. The locals on Shaw don't want to commercialize their island, so be respectful of this if you plan to visit. 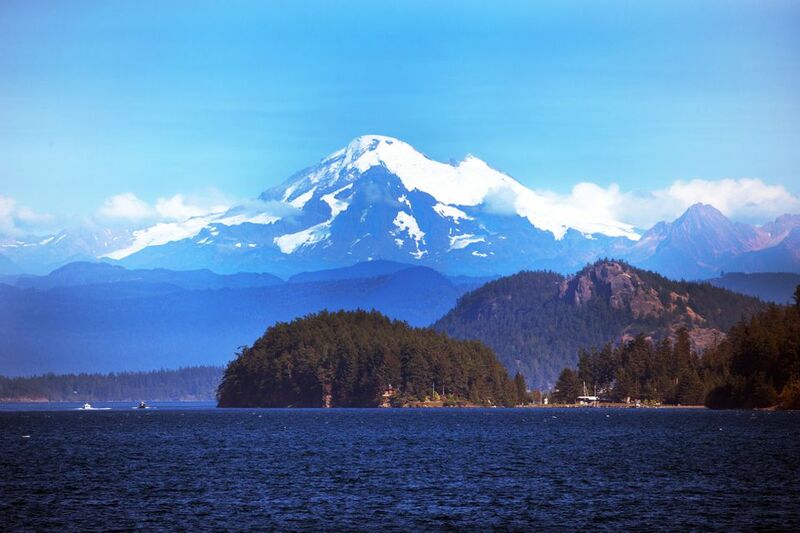 Make a plan and enjoy island hopping cost-effectively with your car through the San Juans.